Available in paper and eReader versions. It has always been believed that happiness depends on love more than on anything else. The greater the love, the greater the happiness. Yet for some unaccountable reason it does not always occur to people that, like everything else that is worth achieving, loving must be learnt. Far from being an exception to the rule, learning to love is more difficult than anything else, because human beings are insatiably selfish and learning to love means learning to be selfless. Mystical Theology is the study of how we learn to practise being so selfless, that we are not only able to love others as never before, but also to yearn for, and to experience, the source of all love that resides in God. Take mystical theology out of Christian spirituality and you are left with laws, rules, regulations and rituals, and a moral teaching that is beyond reach. Take love out of the married or the celibate life, and people begin to seek substitutes that can be disastrous to themselves and to others. The pride of the Second Vatican Council was the New Liturgy that faithfully mirrored the ancient Eucharist, albeit in the vernacular. However, something terribly important was missing. That something is the profound daily mystical spirituality given to the early Church by Christ himself, that gave life and vitality to what can so easily become lifeless without it. Why nothing was done, nor has been done to remedy this situation, is a matter that Torkington addresses in this book. After many years of studying the early sources, the author is able to re-introduce us to this profound mystical spirituality which was the staple diet of everyone in the first centuries. He further shows us how, if practised as it once was, it can not only transform our personal lives, but the lives of the whole Christian community, as what was offered through every moment of the previous week in the prayer without ceasing, is offered together, in, with and through Christ at the Sunday liturgy. It is in giving that we receive and it was the otherworldly love received in practising this profound mystical spirituality promised by Christ to the Samaritan woman, that transformed an ancient pagan world into a Christian world in such a short time; as it can still do to-day. If our liturgy does not once again become the vital living expression of the profound spirituality first lived by Jesus himself, and then lived by his first followers, then the renewal that we endlessly talk about and yearn for, will repeatedly remain beyond our grasp. After many years of studying the early sources, the author reintroduces us to the profound mystical spirituality which was the staple diet of Christians in the first centuries. The book has already been described in superlatives by reviewers even before it was launched. But let the book speak for itself. 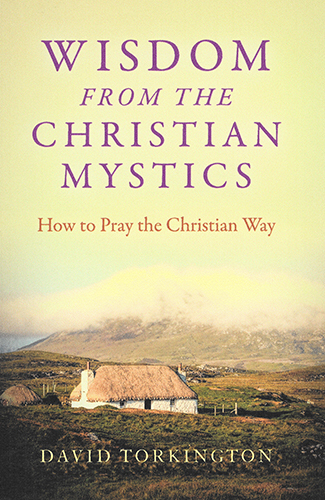 David Torkington has written a delightfully sensitive account of how the mystics of the Christian tradition help lead us to God. Many Catholics, even very prayerful ones, are intimidated by the mere word “mystic.” Torkington shows us that mystical writing is actually a singularly effective tool in imagining the Almighty. God is ineffable, which means He is so different from us that He cannot be described in words. Mystics have the courage to abandon normal categories of language so as to stretch their fingers closer to that which can never be touched. David Torkington has a genuine enthusiasm for the writings of mystics of many eras, and that passion is contagious. It makes him an excellent teacher. Torkington is a faithful guide into lesser-known but marvelously rich pastures. Warmly recommended. The book is of course brilliant as only David Torkington can write it. The central point of the importance of giving quality time to personal prayer to be transformed by the Holy Spirit is truly bought out and is of course so utterly essential and truly misunderstood by so many. I don’t think anyone is taught this these days; semi-Pelagianism is so rife. The current ethos is achieving everything on our own initiative. This encompasses every sphere of our lives. I think this is why there is so much breakdown because humanity is not meant to live without the all-encompassing love of the Father. David is a prophet who has truly been given his gifts to be a voice in the Church. Archbishop Ramsay used to say, ‘There is a God-given space at the centre of each one of us which only he can fill.’ This book, rich in its teaching and quotes from the Fathers, goes a long way towards helping us to fill that centre-space. The book is a masterpiece. It is the sort of work that would, at one age in the history of the Church have the author canonised, at another have him burnt at the stake! David Torkington is my mentor – a storyteller who can deliver spiritual and theological truths couched in a fascinating, riveting narrative. David is a truly inspirational writer. His writings on the spiritual life are simple, joyful and a model of clarity bringing an otherwise abstruse subject down to earth and understandable. When Wisdom from the Western Isles sold out with the speed of light, I was designated translator of Wisdom from Franciscan Italy, and finally this his masterpiece Wisdom from the Christian mystics. All his books answer many important questions about the spiritual life and difficulties we all face especially laypeople like me trying to follow in the footsteps of our Lord. He stresses that we are all called, not only to sanctity but also to mystical prayer, and unequivocally condemns the evils of New Age in all its various and devious forms. I strongly recommend his works, especially this, his masterpiece, to all who are determined to follow the ‘Way’, and earnestly strive towards personal sanctity. Aleksandra Marija Chwalowsky, translator of the Croatian edition. 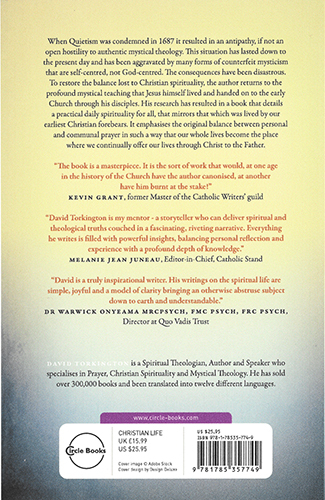 David Torkington is a sincere and prayerful man whose writing is the fruit of a lifetime of prayer. Every book David Torkington writes is about prayer, true deep prayer, but so simply expressed, so colloquial, clear as spring water and as refreshing. We can so easily read about prayer, about love, about Christian service and in the emotional happiness of our reading come to think that we are actually doing what we are only feeling. Fortunately, no one is more aware of this danger than David Torkington. He is passionately committed to stripping from the reader those veils of illusion that allow what is said to be enjoyed in theory only. His books should be mandatory reading.